Ginkgo leaves were a popular motif during both the Art Nouveau and Arts and Crafts Movements in America. The ginkgo was a favorite tree of Frank Lloyd Wright. Originating in China, Ginkgo leaves also appear frequently in both historical and modern Asian art. Emu Tile offers 8 different ginkgo tiles in three different sizes, but this exact design is only currently available in the 3"x3" size shown here. 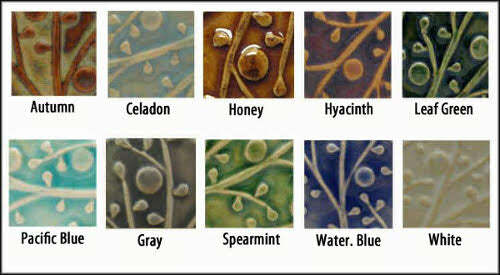 Many glazes to choose from, all non-toxic and lead free. All tiles are made to order, most tiles ship in a month or less. Can be used in permanent installation, or displayed in other ways. Handcrafted individually, using historical methods. Design is rendered in low relief. High fired stoneware is sturdy enough for many applications. Every tile is glazed on top and sides.